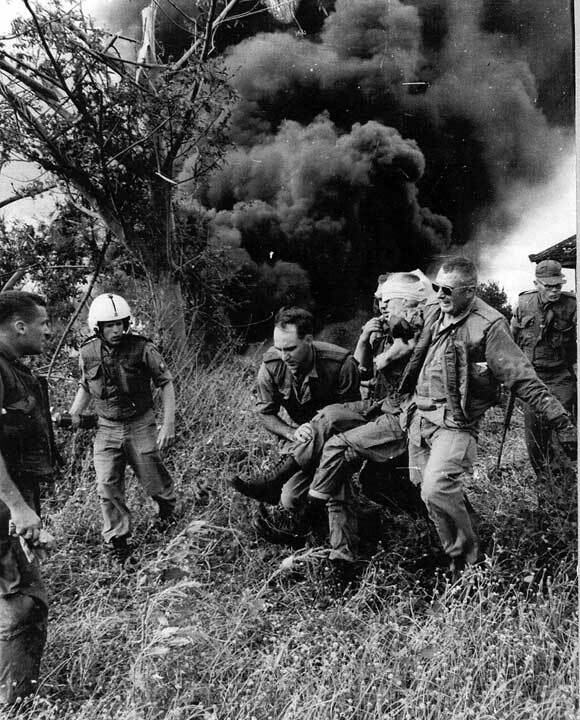 Assault as it forms up at Vung Tau. north of Vung Tau and Baria. 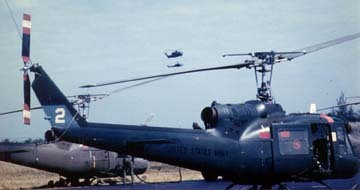 Also note after the 4th UH-1B, we see UH-1Ds ! Ralph Orlando, from his personal diary: "two US advisors KIA, plenty of action. UTT ship shot down--Morgan and 3 KIA. Binh Gia was a big deal. Well over 100 ships. 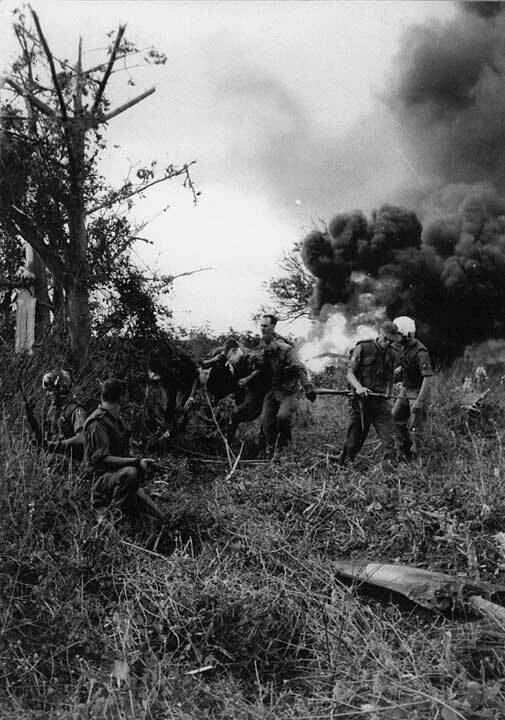 An elite ARVN Bn was lifted in the LZ and by 1/4/65 they were decimated with just traces of them left. This was also the first time there was evidence of Chinese and North Vietnamese fighting with the VC." 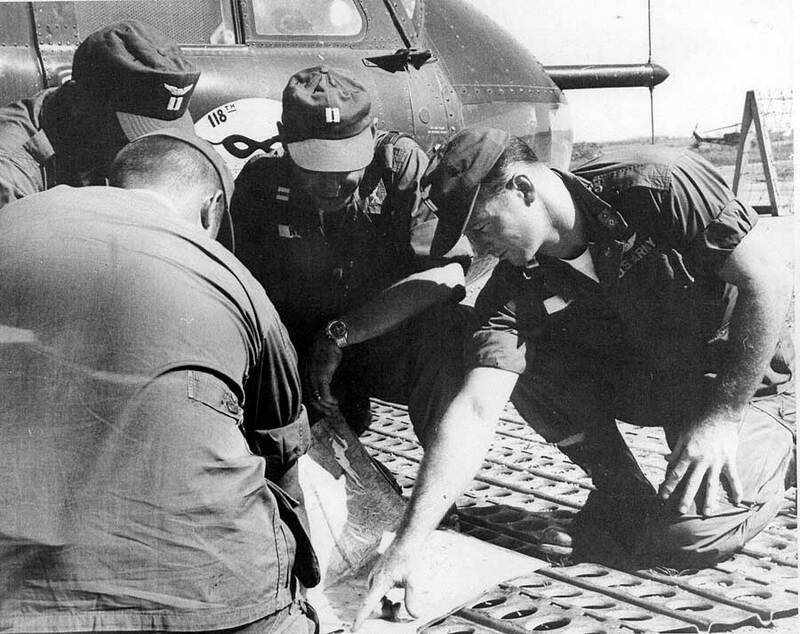 And in Ralph Orlando's log for 2/27/65: "A CA to Binh Gia with 125 ships." That was the last entry in Ralph's log of any activity for the Binh Gia area. Charlie apparently owned it and there was even talk for years to come that US troops shared R & R at Vung Tau with Charlie!! There is a wonderful detailed account of the Binh Gia Campaign in Ralph Young's book, "Army Aviation in Vietnam 1963-64" on pages 26 and 27. The account tells of the shoot down of a 68th UTT gun ship, "Dragon" and the daring rescue of CPT Behnke, Advisor, by CPT Johnson. In all, several ships were shot down during the Campaign ! 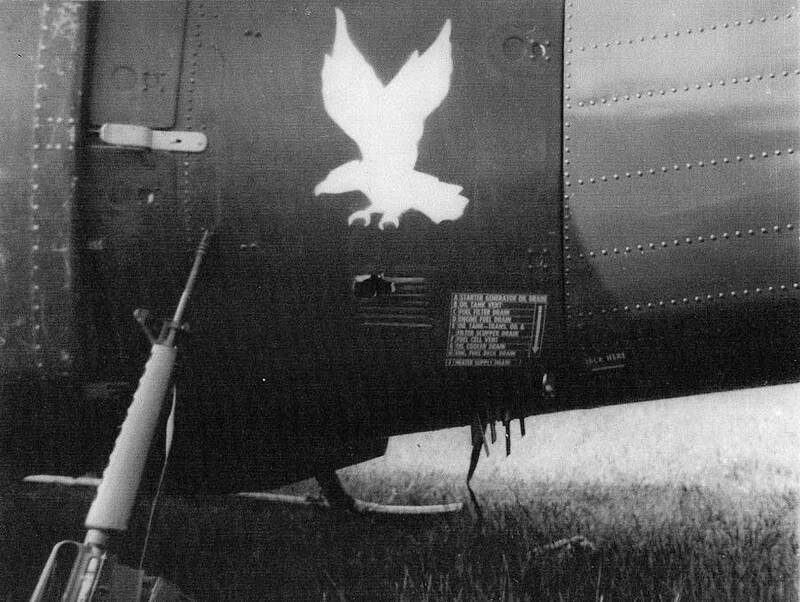 "One of the 68th UTT gun ships that was shot down at Binh Gia(UH-1B #63-08654) was commanded by WO Roy Gordon Azbill, a Dragon (3rd Plt) Fire Team Leader. Roy's call sign was Dragon 3? and the full crew was Roy, WO1 Stephen Edward Morgan, Pilot; SGT Franklin Delano Porter, Crew Chief and PFC Theodore Alan Winowitch, Gunner." "I was there, riding left seat with the Dragon Platoon Leader. I watched as they began to trail smoke, then flames from a fuel cell fire. Then, as the tail boom "drooped and separated: from the aircraft, I clearly saw the nose dropping and the rotor disc then tilting back--in Roy's clearly apparent attempt to keep the nose from dropping. Of course, he couldn't over come the nose tucking condition caused by the tail boom loss, and they crashed, not quite fully inverted, into the rubber trees, just off the S.E. corner of the village." "Another UTT-68th aircraft that got shot down during that series of Binh Gia Operations(32 Dec 64-1 Jan 65) was commanded by WO Mark King." "On December 29, 1964, the 118th Avn Co. (Light) was tasked with several other units to insert an ARVN unit in an area approximately 10 miles SE of Long Thanh where there was hotile activity. 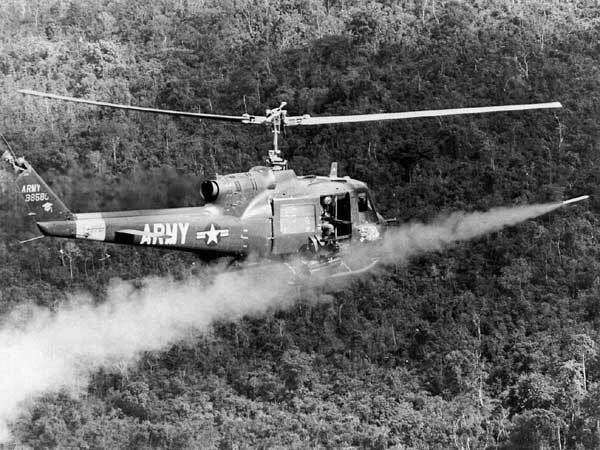 The operation would start at 06:30 with the US Air Force providing a smoke screen along the tree line at the edge of the jungle. 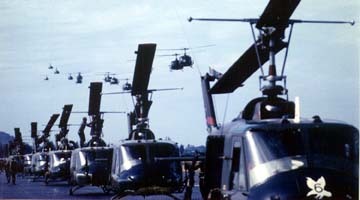 The ARVNs were trucked into an abandoned airstrip in the Long Thanh area where they were helicopter lifted to the smoke screened LZ. There was considerable exchange of fire during the assault. We were to return to the pick-up area for a second lift when upon reaching formation altitude the aircraft behind me informed me that my aircraft had a vapor trail. A few minuted later our hydraulic light began to fluxuations. I decided to put down at a French rubber plantions about 2 minutes later. We landed without problems and found four bullet holes entering the engine compartment and one through the skid. 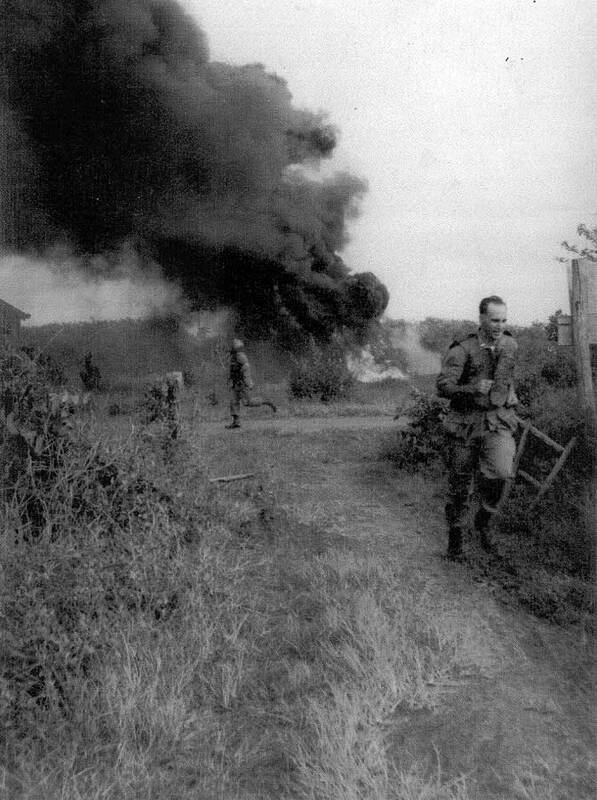 As we took off, leaving the area a few minutes later we observed a Gunship in full autorotation and leaving a trail of black smoke at about 500 ft. altitude. The Gunship crashed about 1 mile from our location. We landed at the crash site almost immediately to find the aircraft had landed in an overgorwn area and rolled over into a hole on it's side and burning. We climbed up the side to pull the door open and lift the pilot and co-pilot from the cockpit. 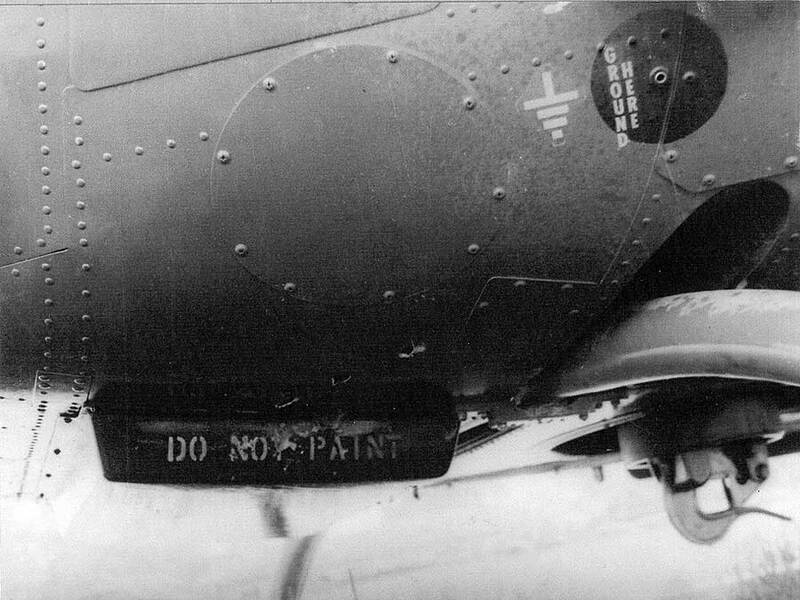 They were handed to us by the crew-chief and gunner because their inturies rendered them immobile. We slide them down the side of the aircraft and carried them some distance away. 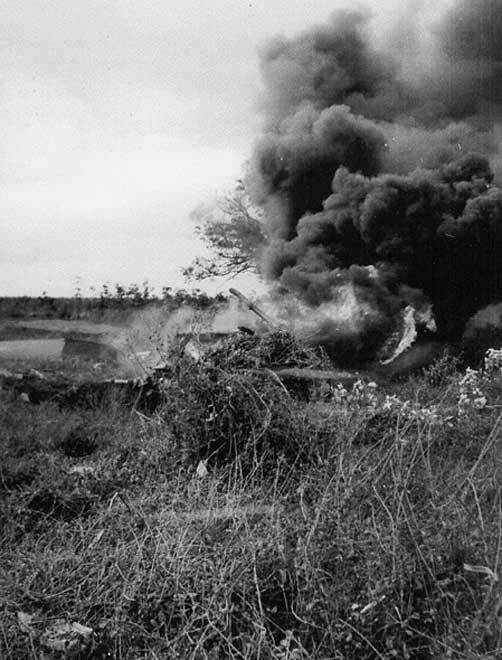 They were evacuated later by another aircraft back to Bien Hoa. I later was returned to the base uninjured. During the course of these activited, I took about 8 photos with a small cigarette-sized camera that I had placed in my "chicken-plate" vest. 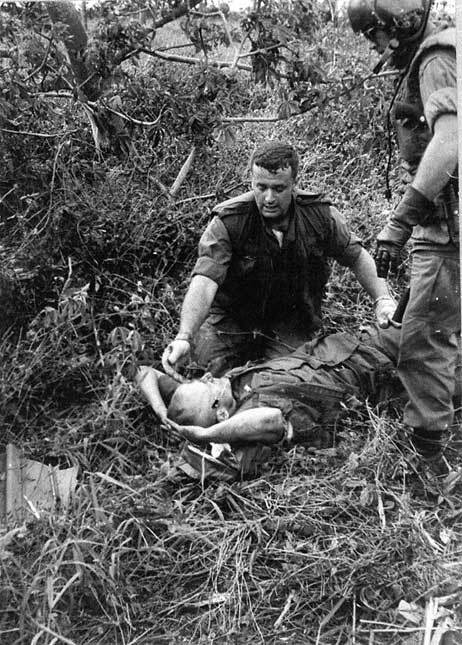 The man assisting the injured pilot with his right arm around him and wearing sunglasses was the S-3 Operations Officer for the 145th CAB, Maj Paul R. Henderson." Bullet holes in belly of Pearce "Rocky"